Digital substraction angiography (DSA) images are routinely used to guide endovascular interventions such as embolization or angioplasty/stenting procedures. In clinical practice, flow assessment is evaluated subjectively based on the experience of the operator. Quantitative DSA (qDSA) using optical imaging has been developed to provide quantitative measurements using parameters such as transit time or time to peak. 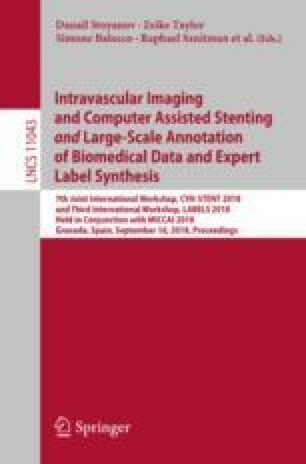 We propose a generalizable method to estimate the actual flow by tracking the contrast agent on the 2D cine images (to evaluate transit time) and using locally rigid registrations of the 2D cine angiograms to the 3D vascular segmentation (to calculate flow rate). An in-vitro endovascular intervention was simulated using a multibranch phantom reproducing a porcine liver arterial geometry. Water was pumped on each exit branch using syringe pump in pull mode. The main intake was switched from water to the contrast agent under angiographic acquisition using a 3-way valve selector. Knowing the actual flow exiting each branch, the same flow was applied to each output in 3 separated experiments (2, 5, and 10 mL/min). The average estimated blood flow rate was within a 16% \((\pm 11\%)\) error range in all experiments compared to the pump flow settings. This novel flow quantifying method is promising to optimize and improve the effectiveness of embolization and revascularization procedures such as transarterial chemoembolizations of the liver.